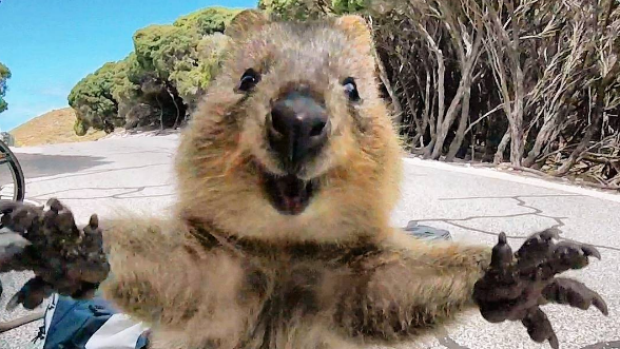 They have been described as the "world's happiest animal" and a photo of a Quokka snapping a selfie has proven why. Around the size of a cat, with the tail of a rat, the nocturnal marsupials can only be found on Australia's Rottnest Island and a handful of smaller islands around the coast of Western Australia. Part of the kangaroo and wallaby family, it has become something of a tourist attraction and visitors flock to the island to try snap a photo with the friendly quokka. So when Campbell Jones was on a bike ride around the Rottnest, and spotted a cute quokka, he stopped for a picture. "As I walked back to my bike, the quokka chased after me," Jones, 21, told Channel Seven. "I put down the GoPro [camera] and it jumped at me as if to say come 'come back'." "They [the quokkas] just walk up to you," he said. "They are pretty friendly little things. We just went down to take photos of them and snagged [captured] a beauty, I suppose. It has been humbling that so many people wanted the photos." Quokkas, famous for posing in selfies, are native to Rottnest Island where about 10,000 live a sheltered life free from predators or traffic. They are classified as a vulnerable species and have been almost completely wiped out on the mainland. Campbell isn't the first tourist to snap a selfie with a quokka. Allan Dixon, who has been described as the "real life Dr Dolittle", regularly posts photos with the marsupial... along with other epic animal selfies.